Gard Your Car From Rust to protect the integrity of crucial safety features. 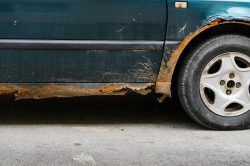 Rust-protection goes deeper than your car’s paint job – Brian Turner for Driving.ca warns of the very real dangers of allowing corrosion and rust to form on your vehicle. Some car parts are more prone to rust than others, and leaving some crucial parts unprotected can have dangerous consequences. Body panels and underbody metal, parts that can have a severe impact on the safety and quality of your vehicle, are particularly prone to rust. Driving.ca points out that in many Canadian communities police services do roadside safety inspections and can order your car be towed for excessive corrosion. What’s more, rust compromises the integrity of your body panels and can jeopardize you and your passengers’ safety in the event of a collision. Holes in your car’s body can admit water and damage the electrical systems, and if there are holes near the tailpipe they may allow exhaust gases to enter your cabin. The sub-frames, which support the suspension and steering components, are metal parts on the underbody that are prone to rusting and perforation and can detach if not properly cared for, risking the car’s steering and suspension.